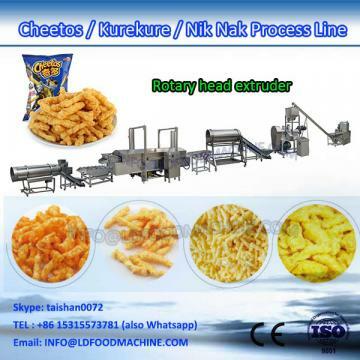 Kurkure extruder adopts corn, rice, wheat, oat, barley etc as ingredients to make Kurkure . Through friction of screw and barrel, the grains are cooked in the extruder Barrel. Forming is at the die face cutter. 1. Raw materials of Kurkure extruder machine. Adopts corn, rice, wheat, oat, barley, millet, sorghum etc as main ingredients.Other material: salt sugar powder, flavor material, cocoa powder and so on…. 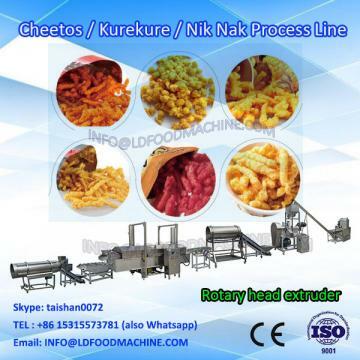 All the Kurkure extruder machineare made by stainless steel, this whole line is with reasonable design and with high automation; the screws are made by alloy steel, with building block system structure and self-cleaning function. Details & Features of Kurkure extruder machine. 1.Wooden packing for Kurkure extruder machine. 2.All machines apply Fumigation of wooden packaging. 3.We guarantee the quality of packaging to ensure your machines safety. g.) Provide 1 year complete warrantee and life-time maintenance service;The seller is responsible for the nature damage of the machinery in one year except for man-made damage.All spare parts and wearing parts are attached with the machinery for free; and these parts should be enough for one year use. 6) Complete plant to make biscuits and cookies and other bakery items. 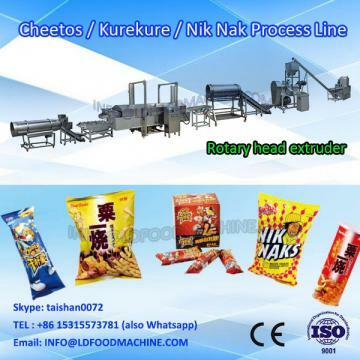 9) Primary and secondary Packing Machines for snacks food products. 10) Tailor made snacks food machine as per specific need of customer.